Adding a database allows students and instructors to build, display, and search a bank of topics contributed by the class. 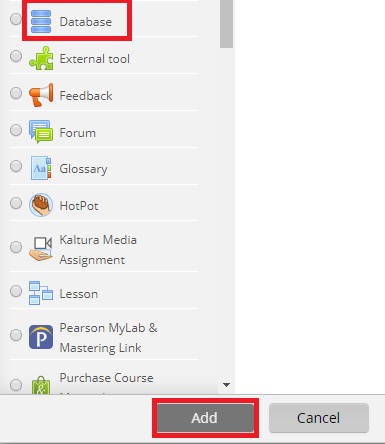 The following steps will show how to create a database in Moodle 3. PLEASE NOTE: There are two different ways to complete the next step depending on which view you are in. If you see two separate drop-down boxes, click Add an activity and select Database. For more information about this option, view Activity Chooser Options. 4. Select Database from the sidebar at the left, then click Add at the bottom. 5. Type a Name and write an introduction for the database. 6. Click Save and return to course. Personalize your Database Activity in the Database Activity Settings. Create the database fields in the Building a Database.